TOPSoccer (The Outreach Program for Soccer) is a community based program that is designed to meet the needs of children and young adults that have physical and/or intellectual disabilities. The program is geared towards player development rather than to competition. We make it a fun and meaningful experience for your child. The program will be full of games and activities adapted in ways that ensure your child will learn at his/her own pace. Practices and games will be organized. The program will improve the overall fitness, self-esteem and social skill of your child. With help from high school and parent volunteers, LUSC strives to have as close as possible a 1-to-1 volunteer-player ratio. It is offered to Lexington residents and those from surrounding towns. The program is hosted by over a dozen other communities in Massachusetts. 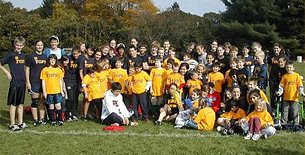 TOPSoccer is sponsored by US Youth Soccer and Massachusetts Youth Soccer.